32 Years. 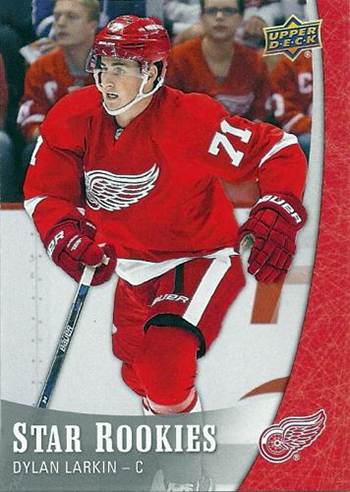 It had been 32 years since the Detroit Red Wings had a teenager score in their NHL® Debut. 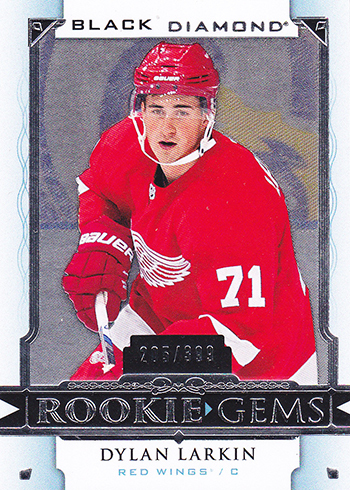 However, on October 9th, 2015 Dylan Larkin became the first Red Wing since Steve Yzerman in 1983 to make the opening night roster as a teenager and then score in said game. 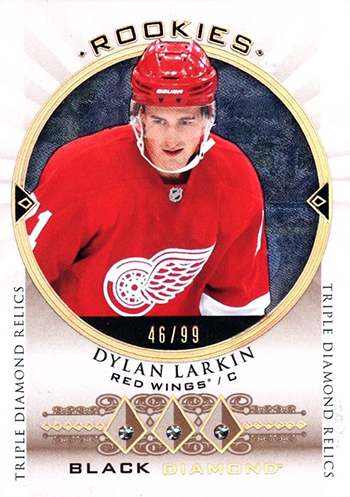 This was the first sign of what a truly special player the Red Wings have in Dylan Larkin. He plays for the Detroit Red Wings, a storied original six franchise with one of the most passionate fan bases in all of sports. By NHL® All-Star Standards, he’s the fastest skater of all-time. He currently leads the Red Wings in goals & points. He makes a great first impression. His rookie stats are near the top in most every category and he is getting strong consideration for the Calder. 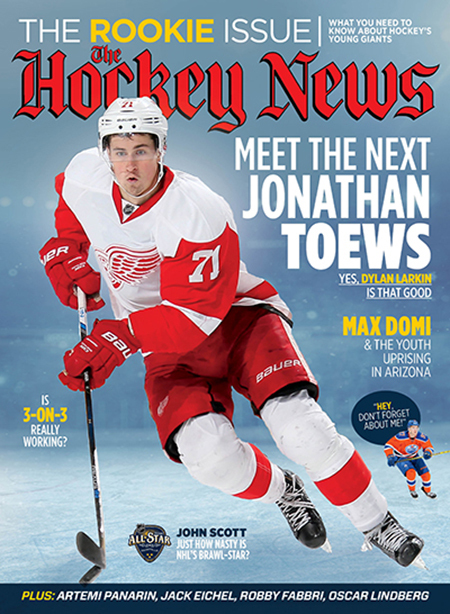 He was recently featured on the cover of “The Hockey News” and the title says it all. 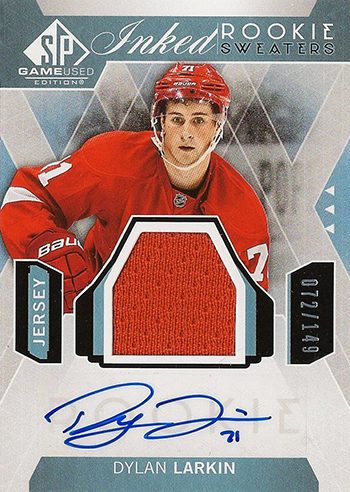 As Upper Deck found out at the 2016 NHL® All-Star Game, he is not just popular in Detroit. 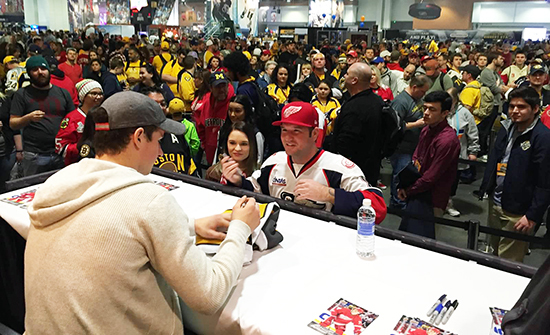 When Upper Deck had Larkin do a free signing at the NHL® Fan Fair the line was so long that…well, see for yourself. Detroit is building a stable of skillful youth that will soon, if not already, rejuvenate an already talented Wings squad. Larkin as well as Andreas Athanasiou, Anthony Mantha, Gustav Nyquist, Tomas Tatar, Petr Mrazek & Teemu Pulkkinen will form a very exciting core. It’s an honor to don the Red, White & Blue Team USA jersey, Dylan has already done that numerous times including the 2015 IIHF World Championships…as a teenager. Oh and you’ve got to see this! And when it comes to opening hockey packs, he’s got some skills. 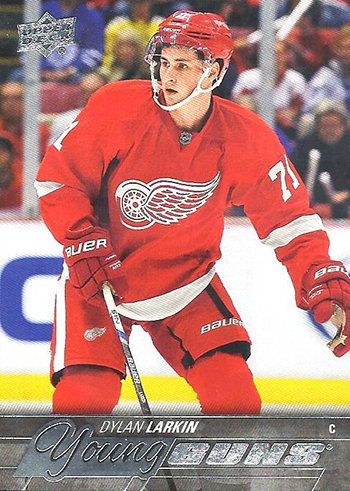 Maybe I geeked out a little when we spent some time together, but come one; it’s Dylan Freaking Larkin! So when it comes to collecting, you’ve got a variety of options. Upper Deck makes a variety of cards under the old saying, “Different strokes for different folks.” Here are just some offered this season from simple and easy to acquire to those for the most serious collector. While others are collecting Connor, think strongly about collecting Dylan. 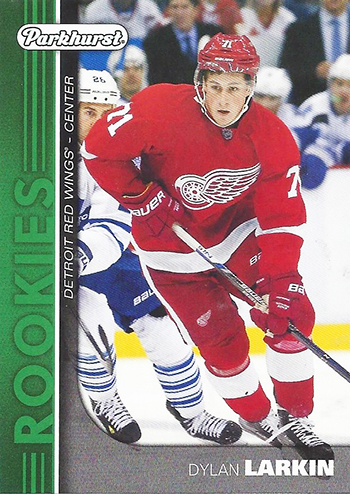 His Young Guns rookie card found in 2015-16 NHL Upper Deck Series One is one of his most sought after rookie cards. 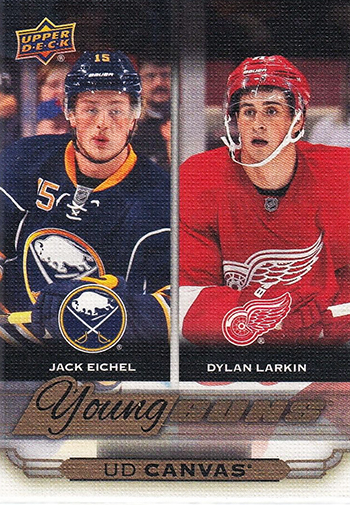 The Canvas checklist card also features Jack Eichel in Upper Deck Series One. 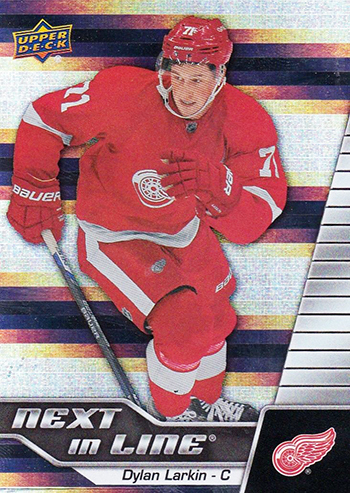 The Parkhurst rookies can be found in retail versions of the Upper Deck Series One set. 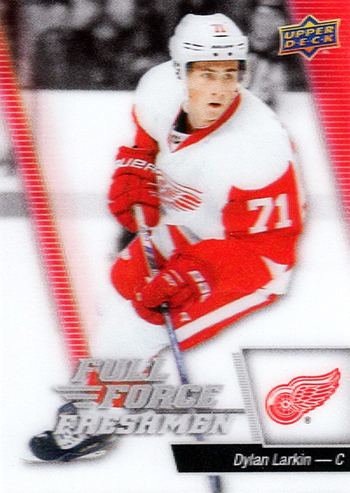 Full Force is a product that features a lot of rookie content including this 3-Dimensional rookie card of Larkin! 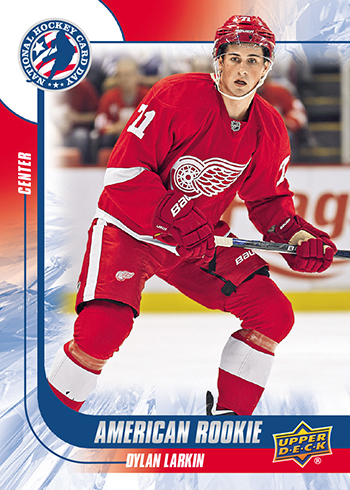 The Overtime product is available through select hobby shops and has a pretty popular rookie card of Larkin. Upper Deck released a Rookie Stars Box set that is a VERY easy way for fans to get rookie content of all the best players in this draft. 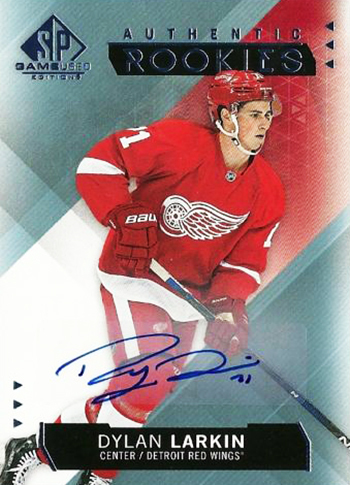 Upper Deck’s National Hockey Card Day product was another very easy way for fans in the USA to acquire rookie card content from Larkin just by visiting their participating card shop. 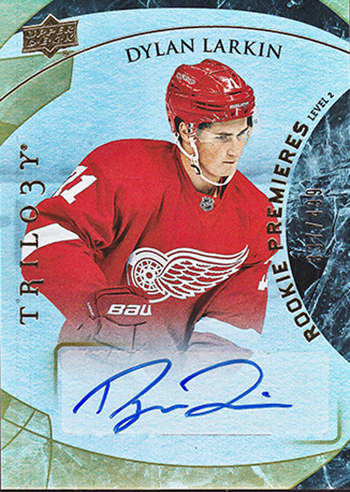 Upper Deck’s 2015-16 NHL Trilogy also has some very nice Dylan Larkin rookie cards to score. Black Diamond is the release where we first started to see some very high-end content in the market. This card from Black Diamond actually has three diamonds embedded in the card. Exquisite content made a debut in Black Diamond as well! 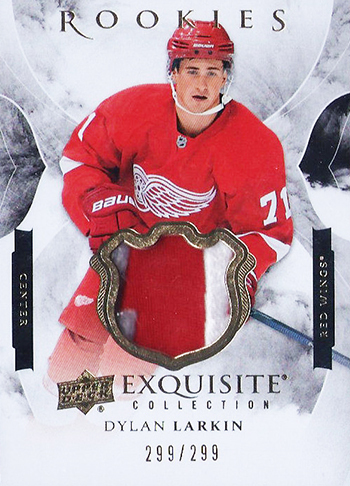 The 2015-16 NHL SP Game-Used product has a significant amount of Larkin rookie elements to them. 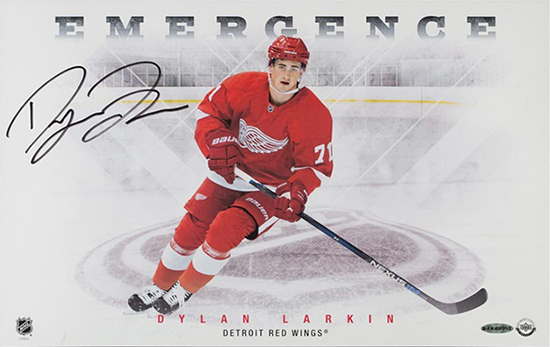 Dylan Larkin also signed a variety of sports memorabilia for Upper Deck Authenticated that signals his “emergence” in the NHL.